Lasers with quantum dot active layers drastically reduce temperature sensitivity of light output characteristics of 1300nm communication wavelength lasers. The characteristics provide much easier handling for customers in evaluations and adjustments than conventional quantum well lasers. 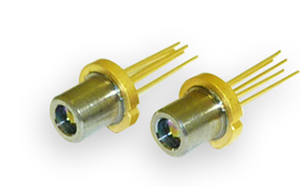 QLF1339 is a 1310nm Fabry-Perot (FP) laser, and QLD123x is 1240 – 1270nm Distributed Feedback (DFB) laser. These lasers are mounted in a TO-CAN package with a lens cap.